The Saints were the strongest team in the mighty NFC South last season. For New Orleans to build on that playoff run, it will need to navigate through one of the NFL’s strongest schedules in 2018. The combined 2017 record of New Orleans’ opponents, thanks in part to having two other playoff teams in its division, is 137-119. That’s tied with Detroit for the second toughest in the league. Here’s breaking down the Saints’ entire schedule and how their 2018 games set up Drew Brees & Co. for a Super Bowl push. The good news for New Orleans fans is that a team that was a mere seconds away from an NFC Championship Game appearance returns a lot of familiar faces. Namely Drew Brees, who signed a two-year deal this offseason to remain in the Big Easy. And while they may not have gotten a reunion with Pro Bowl tight end Jimmy Graham, they did bring back veteran Benjamin Watson, who returns after spending a season with the Baltimore Ravens, and signed former Chicago Bears receiver Cameron Meredith (888 yards and four touchdowns in 2016). Last year, the Saints offense ranked second in the NFL in yards and fourth in points. Now that Brees, Mark Ingram, Alvin Kamara, Michael Thomas and Co. have had a season together, there’s no reason to believe that they won’t be able to duplicate—if not improve—their 2017 performances. There’s no question that a Brees-led offense is always going to move the football. On the other side of the field, though, last year was a coming-out party for the defense. Reigning NFL Defensive Rookie of the Year Marshon Lattimore was just one of many playmakers to step up on defense last year. Adding veteran Kurt Coleman to the secondary should only make the defense even more dangerous. The first thing most New Orleans players and fans probably did was circle the date (Oct. 28) the Saints take a trip up to Minnesota for their first meeting against the Vikings since a heartbreaking defeat in the playoffs. Beating the Vikings in the regular season would hardly ease the pain of the playoff loss, but it would at least give the Saints a taste of redemption. Only a matchup with the team responsible for ending New Orleans’ season could overshadow the Super Bowl champs coming to town on Nov. 18. A meeting with the Philadelphia Eagles will provide a barometer for the Saints to gauge how they match up with the best teams in football. Don’t forget about a Nov. 4 game against the star-studded Los Angeles Rams, either. After winning the NFC West last year, they have had an active offseason, adding the likes of Aqib Talib, Marcus Peters, Ndamukong Suh and Brandin Cooks. With winning comes spotlight games. Down the stretch, New Orleans will play three prime-time games in four weeks, a stretch that also features three consecutive road games. The 2018 slate will be anything but a cakewalk for New Orleans. The schedule features eight games against playoff teams from a season ago, not including the Baltimore Ravens, who were eliminated from postseason contention in the final minute of their season. Incredibly, the Saints will play every 2017 NFC playoff team next season. 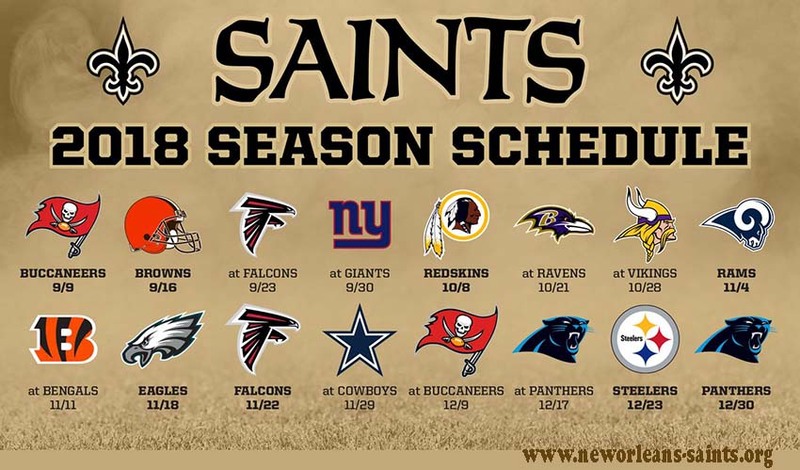 There’s no doubt that the Saints are dealing with a first-place schedule. Toughest tests: The Saints were able to go 7-1 at home last year on their way to an 11-5 overall mark. It will be tough to duplicate that Superdome success with the Falcons, Panthers, Rams, Eagles and Steelers bringing their best to New Orleans. The good news: It would be a lot harder to face those teams outside of the Big Easy. Biggest breaks: Outside of the division games and the Vikings matchup, the Saints have a favorable away slate and should finish better than .500 on the road. With Minnesota and Dallas on the schedule, that leaves only three games in which there might be weather concerns. Then again, with New Orleans’ improved running game and defense, it’s an undaunted team built for all seasons.